In 2008, Bill Crain, a professor of psychology at The City College of New York, and his wife Ellen, a pediatrician, opened Safe Haven Farm Sanctuary in Poughquag, New York. The sanctuary provides a permanent home to over 70 animals rescued from slaughter and abusive situations, including goats, sheep, chickens, turkeys, ducks, partridges, and a mini-horse. It also has afforded Bill a tremendous opportunity to observe animals in all manner of emotional states and how their behavior casts light on the emotions of human children. Crain suggests that the reluctance to follow Bowlby�s lead reflects the Western worldview that considers humans as different from and superior to other species. To think about children in the same category as animals seems to demean children. 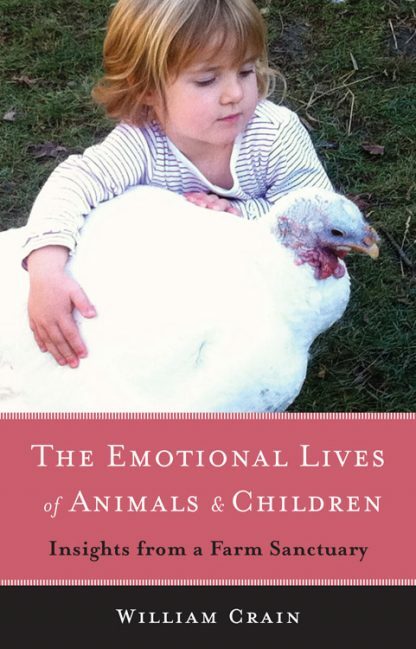 But Crain discovered that the farm animals� emotional behaviors can help us understand those of human children. The Emotional Lives of Animals and Children is divided into two parts. Part one discusses six emotional behaviors that are shared by animals and children: fear, play, freedom, care, spirituality, and resilience. Part two addresses the broader social theme of our Western culture�s disparagement of animals. Initially, children do not set themselves apart from nature, but experience it with an instinctive empathy. However, they are eventually taught by our society to detach themselves and to devalue animals. Safe Haven Farm Sanctuary is located in Poughquag, New York, about an hour and a half outside of New York City. Its focus is on the rescue of abused and neglected farm animals. In doing so, it hopes to raise awareness of the plight of animals raised for food and the benefits of a vegan diet for animals, human health, and the environment. Wherever possible, the sanctuary tries to implement environmentally sound practices such as solar heating and the use of reclaimed wood.